Trysil is Norway’s largest ski destination and offers a varied set of alpine opportunities, regardless of whether you’re looking for family-friendly skiing, wide slopes, terrain parks, or off-piste challenges. And best of all – they have snow guarantee! Trysil offers interconnected ski areas, all with their own distinctive characteristics. From the black slopes in Høgegga to the red, blue, and green slopes at Skihytta, Trysil Turistsenter, and Trysil Høyfjellssenter. The large children’s areas on both sides of the mountain is where you will find Valle the snowman and other fun-filled opportunities for children, and ensure a good skiing experience for the whole family. Stay comfortably in one of Trysil’s high standard resort hotels, hire a cabin where several families can live together, or choose a modern holiday flat adapted for active people. You will find that almost all accommodation in Trysil is situated on or near the slopes, with ski-in/ski-out facilities. Check out piste map, weather reports, and webcams from Trysil. For more information please visit Skistar’s official website. 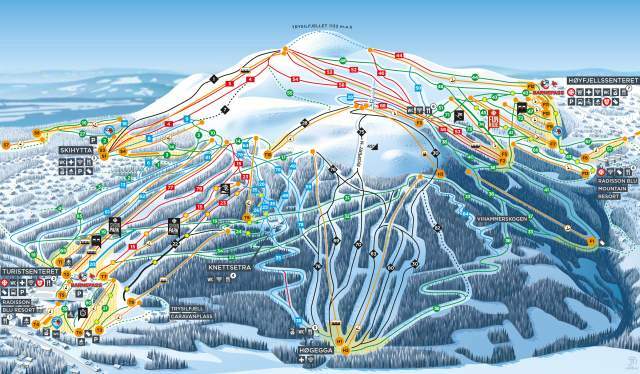 Get in-depth travel information at Ski-star&apos;s official website. Elverum is the nearest train station, approximately 70 kilometres from Trysil. There are several corresponding buses per day. The train to Elverum takes around 2 hours from Oslo, or 5 to 6 hours from Trondheim. By car or by bus, travel time from Oslo to Trysil is approximately 2,5 hours. There are several daily departures by express bus between Trysil and Oslo. Advance booking is advised in the winter, when buses will often be fully booked before departure. Check out SkiStar Trysil’s website for prices and timetables. Oslo airport is situated 2 hours by road from Trysil. There are several daily departures by express bus between Trysil and Oslo airport throughout the year. Elverum is the nearest train station, approximately 45 miles from Trysil. There are several corresponding buses per day.